Wagyu beef is fast becoming one of the most desirable meats in the world. Described as the Foie Gras of beef, Wagyu has become famous for its intense marbling which produces a tender, juicy, naturally enhanced flavour to the meat. 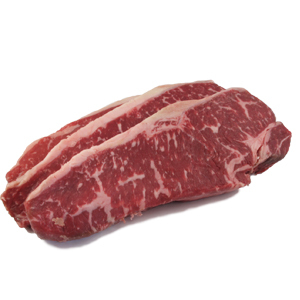 The meat is high in omega 3 and omega 6 fatty acids as a result of its intense marbling. Wagyu is proven to be significantly lower in saturated fat and higher in healthy monounsaturated fat making it far healthier than any other breed of beef available on the market. This high degree of marbling is unique to the Wagyu breed and gives the meat a buttery flavor which cannot be rivaled in tenderness or juiciness by any other beef. Hmmm, I *do* like well-marbled beef. My first time on your site, adding to favourites here and will come back to browse later.